SearchLight is a free, online spectrum plotting and analysis tool that allows fluorescence microscope users and optical instrument designers to model & evaluate the spectral performance of fluorophores, filter sets, light sources, and detectors as components of an overall system. Its intuitive user interface makes it easy to manipulate spectral component specifications and plot spectral results. The System Calculator allows the user to quantify system metrics including signal, SNR, and bleed through; as well as to compare various system configurations against each other. Any number of spectra may be plotted simultaneously, and an entire graphing session sent to colleagues for collaboration using the "Share" feature. SearchLight sessions can also be saved into your personal account for future use. SearchLight contains an extensive library of 809 fluorescence spectrum models, 182 light sources, more than a dozen detectors, and Semrock's entire library of filters and filter sets. "MyData" allows you to upload your own custom datasets for any components not currently included as a selection choice. Save time in the lab and make every photon count with Searchlight! SearchLight was one of the featured tech products on NewsWatchTV airing on January 6th, 2017. NewswatchTV airs on the Discovery Channel, AMC, and ION Network in over 200 Markets nationwide in the US. Enjoy the following feature. SearchLight App available for iPhone & iPad. Advanced features for data management as well as simulations can be accessed using the SearchLight spectra viewer. We now offer a SearchLight App available for iPhone & iPad. Now you have all the popular features available from the SearchLight plotting tool right at your fingertips anytime, anywhere. Downloading this App is free and easy. Simply search for "Semrock" in the App Store and follow the download instructions for SearchLight. 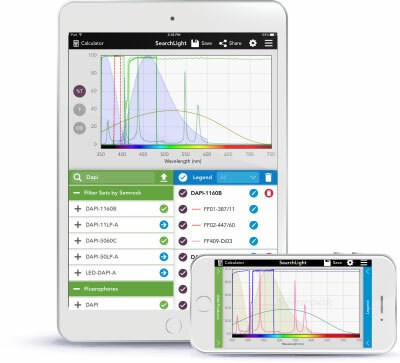 SearchLight Compare System Calculator feature quantitatively computes the fluorescence signal, noise, and signal-to-noise ratio for unlimited combinations of filter sets, fluorophores, light sources, and detectors. Calculations are based on a straightforward mathematical framework, which is described in detail in the white paper Spectral Modeling in Fluorescence Microscopy. SearchLight Calculator takes into account all the spectral components of a typical epifluorescence microscope configuration. See the white paper Spectral Modeling in Fluorescence Microscopy for additional details.